Don’t Forget Your 2017 Homestead Exemption! Tax season is upon us once again, and that means that it’s time to gather up your homeowner paperwork and head over to your accountant or tax service to file your taxes. If you bought a home between January 1 and December 31, 2016, it’s time to file for a homestead exemption by the March 1 deadline! The Florida homestead exemption is a benefit that you do not want to miss if you moved into a new home last year. The homestead exemption is a tax exemption that allows qualified Florida homeowners who reside on their property a chance to reduce the taxable value of their property by as much as $50,000. The Florida homestead exemption is not an automatic benefit, but one that must be obtained by the individual homeowner by filing for the exemption with the local Property Appraiser in the county of the residence. Though only available for the primary home of the individual, the homestead exemption is one of the most used and effective benefits that can be claimed by Florida residents. Once qualified, there is no need to reapply each year if the permanent residency and property ownership do not change. Florida law states that the homestead exemption is only available to qualified Florida residents. To qualify, applicants must be either a US citizen, a permanent resident alien, or legally allowed to remain in the United States permanently. As mentioned, this is a tax exemption that is only applicable to the individual’s primary residence including houses, condominiums, co-op apartments, and some mobile home lots. Businesses, second homes, and rental properties are not covered under the exemption. Persons who claim permanent residency in another state or have applied for residency tax credits in a state other than Florida also do not qualify for the exemption. Before you can qualify, the deed of ownership (or co-op proprietary lease) must be filed with the County Public Records Office before January 1 of the year you are claiming as evidence of ownership. If your deed is not on file, Florida state law is prohibited from granting the homestead exemption for the property. WHAT DO I NEED IN ORDER TO FILE? 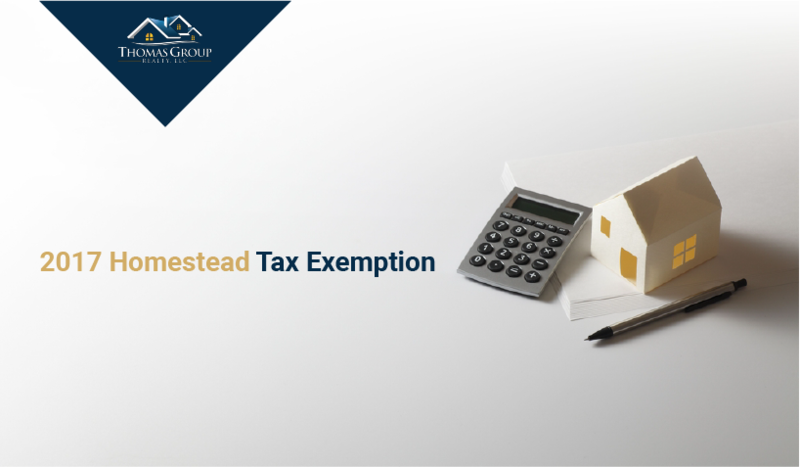 Qualified Florida residents will need to provide a few items when filing a homestead exemption application. Be ready to provide proof of ownership, proof of permanent residency in Florida, and, if you or your spouse have previously held exemptions in another state or country, proof of surrender of exemption in the other jurisdiction. In most counties of Florida, you can file your application for the Florida homestead exemption online. Your local County Property Appraiser’s’ office will also have printed applications available. For other counties not listed here, an online search for “[County Name] homestead exemption online application” will yield your county’s online application form if available. All applications for the 2016 homestead exemption must be filed by March 1, 2017. Applications received after this deadline will not be accepted or evaluated for homestead exemption, so be sure to file your application as soon as possible to take advantage of this great benefit for Florida homeowners. For more information about the homestead exemption, including FAQ’s and additional property tax information, please visit the Alachua County Property Appraiser’s website.